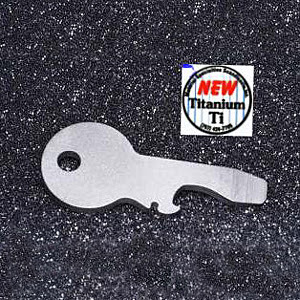 This is a very small tool made of Titanium, it is shaped as a door key measuring 2 1/2 inches in length and about 1 inch wide. The tool can be used as a flat head screwdriver, as a bottle opener and to bend wire. The screwdriver works well. Since the top side of the bottle opener is the screwdriver the suface in contact with the bottle cap will be thin so a little extra force is needed compared to other bottle openers but of course this is not an issue since opening a bottle isn't a task that demans a lot of strength. Made of titanium the tool is very light and stronger than steel with incredible resistance to corrosion. This property makes this a good tool for boating or environments near the sea where corrosion due to salt water may be a big problem. You can put this tool in your keychain and it won't get rusty. It is a little pricey but Titanium is not a cheap material. You can order for $25 from this site. This is a very small keychain lock-picking tool measuring just 2.25 inches in length it can go in a keychain and won't be noticed among all the normal keys. The tool has 3 picks and a mini tension tool. The first pick is a car lock pick, a double sided jiggler pick. The second pick is a double bump rake pick that is good for drawers, padlocks and doors the double bump makes the work faster since the chances of hitting the correct pin are doubled when raking. The third pick is a feeler pick, with just a single bump to set pins individually, this can be used in more difficult locks or for training to detect the individually setting pins. The tool comes with a small tension tool that can be removed turning a screw, it is good for tension in small locks but won't work with big sturdy locks. Make sure you don't lose the tension tool because otherwise all the picks become useless. This small tool can be ordered for $6 from this site. The Trance is a folder designed by Chad Los Banos for Boker USA following the succesful line of the Subcom and Rescom folders. The Trance is the big brother in the Los Banos family with a 2.75in blade and a total length of 6.25 inches. The total weight is 3.2 ounces. The trance follows the Subcom design with a handle that is half zytel and half steel the zytel has a good texture and helps the grip, the half-steel is slippery but I don't think the grip is a problem even when only half of the handle is textured. To open it the Trance has round metal thumbstuds and a flipper, you can use either the thumbstuds or the flipper to assist the opening. The flipper when opened offers a surface where your index finger can rest and be protected from the blade if you need to push hard on the knife. It's particularly easy to open the knife in a wrist-flick movement using the flipper and closing it is a smooth movement. Users that are familiar with the thumbstuds can of course just ignore the flipper. The blade made of AUS8 steel is very sharp from the factory and sustains the edge very well after most normal cutting jobs. Sharpening is not a problem with this type of steel. The lock is a framelock mechanism that holds very well and can be operated with one hand if needed. The Trance has a pocket clip that can be moved for tip-up or tip-down carry, the clip is very strong and long enough to avoid losing the knife but as in the subcom model clipping it to a pocket can be a little harder due to the tension of the clip. Summarizing the Trance is a very nicely designed folder small enough to be an EDC knife and big enough to perform excellent in typical cutting jobs, the construction is very solid and everything works as expected a great option for its price range. You can get the Trance from EDCdepot for $30.